Galway Golf Club: a view from the clubhouse to the ninth hole. So a trek through the Tribes county was decided upon. First port of call was Salthill, just on the outskirts of Galway city, home of Galway Golf Club. As we approached the clubhouse and looked back over our shoulder onto the Aran Islands, one could not help but think of the auld song ‘Galway Bay’. A warm welcome from club pro, David Mortimer, who incidentally is a two-time winner of the Irish PGA Championship, and we were out onto the fairways. 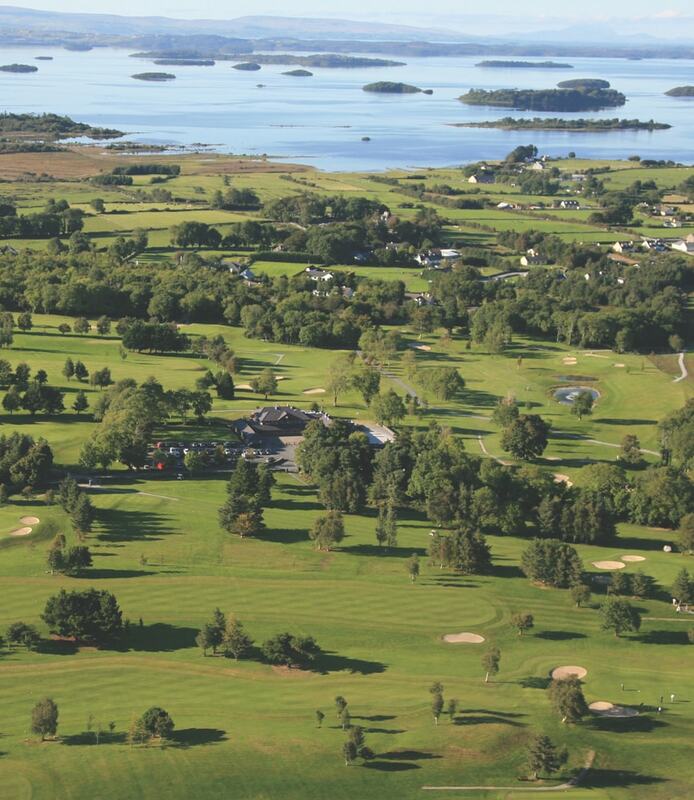 Oughterard Golf Club with views of Lough Corrib. 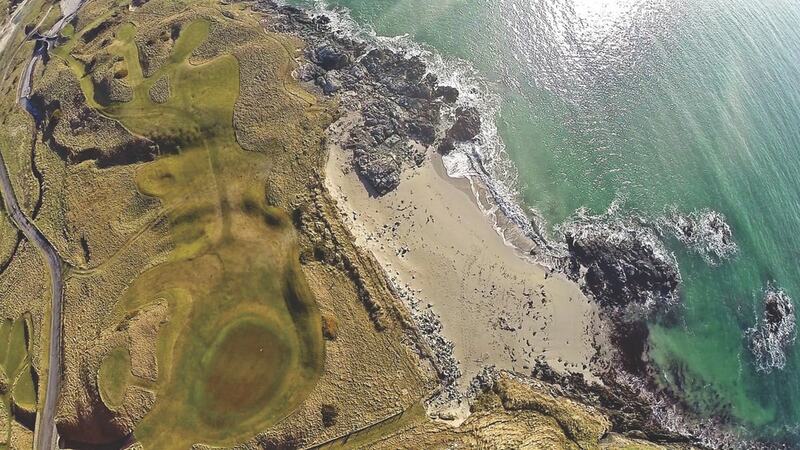 The magnificent eighteen-hole championship golf course, situated at the Gateway to Connemara, is a recipient of the Hidden Gem of Connacht Award. Galway is a well-established club, the game having been played here since the late 1800s. Ryder Cup players Christy O’Connor Senior and Junior both learned their trade here. The par is 70 with every inch of ground used so wisely. A short dogleg par 4 to start, while possibly yielding a birdie or par start can just as easily show a seven or more. Trees, shrubs, elevated greens, and an abundance of beautiful—but testing—wild gorse ensure that the A game is required. As one progresses through the greens and reaches the back nine, the views become breathtaking. Standing on the fourteenth tee box, one is monarch of all they survey. The Burren and the Aran Islands are in the near distance of Galway Bay with the extent of the whole course in the viewfinder. And immediately in front, a rolling fairway, reminiscent of the American fairways as we watch the weekend competitions of the PGA tour on our TVs. For that split second, you feel as if you could have Bubba and Mickelson on the tee with you—alas, not so. After a trek of almost six thousand meters, our afternoon was done. With congratulations from ourselves ringing in our ears for choosing such a fine specimen, the nineteenth was our next port of call for a chowder and a pint. Well, if it was good enough for the famed Ryder Cup stars, it was certainly good enough for us. A very short trek found us at our headquarters for the night—the majestic Glenlo Abbey on the west side of Galway city, right on the shores of Lough Corrib. As we drove down the avenue, the building and the lake were right in front of us, with greens and fairways on either side. And the Pullman Restaurant (two of the original Orient Express train carriages) was in our eyeline. A beautiful dinner—and too many pints—but a restful night’s sleep saw us fully charged for the day ahead. Serious stuff, so we had a spell on the driving range and then tackled the testing but idyllic track with water features. Not only the Lough, but throughout the course. The signature hole here is definitely the par 3 two-hundred-yard fourth hole that sits in the middle of the lake. The course is obviously lovingly cared for and has fantastic undulating greens, having been designed by the aforementioned great Christy Jnr. Our next round was in the Gateway to Connemara, just a twenty-kilometre drive to the small town of Oughterard and its gorgeous parkland track. A par of 72 sees the golfer around many treelined but pristine fairways, again with water a feature, none more so than the par 3 ninth hole, on an elevated tee box to a tricky green lurking behind water. Further is definitely better than short here. Club professional Derek McNamara was on hand to welcome us and even guided us to the very tricky opening par four—up and over the hill. When playing Oughterard, bring the thinking game—plotting and planning may avoid the trees and shrub plantations. Truly well worth a visit on the golfing getaway. 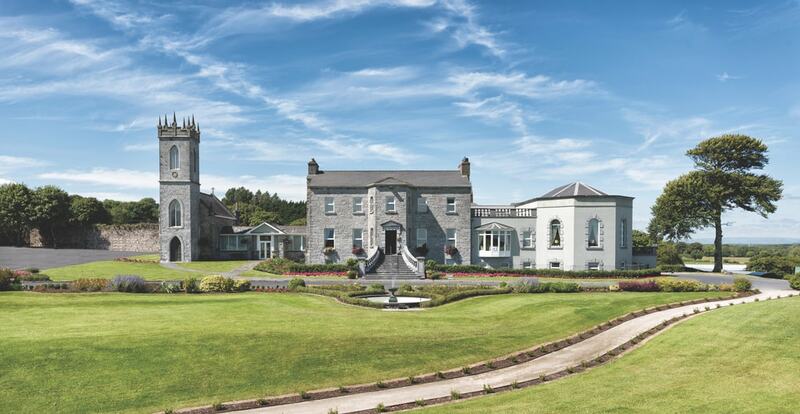 Rising majestically from the shore of Lough Corrib and dating back to the eighteenth century, the five-star Glenlo Abbey Hotel is where old-world charm meets contemporary elegance. 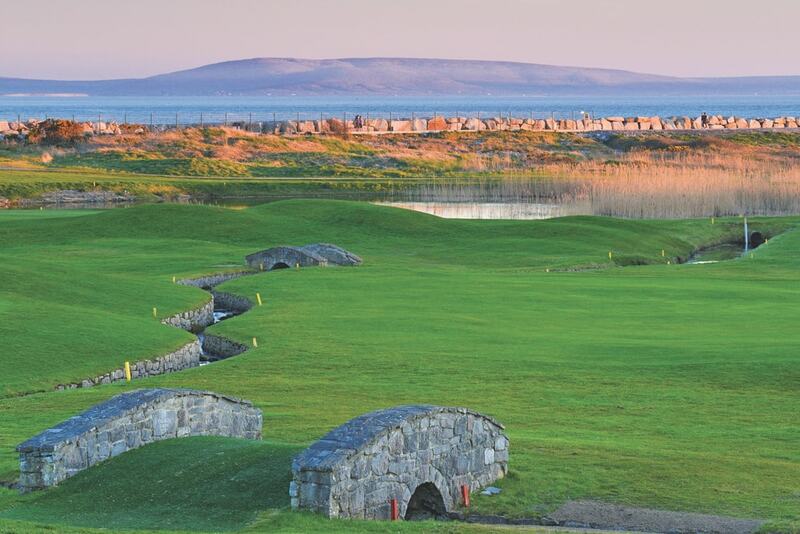 Galway Golf Club: a view to the Burren and Galway Bay adjacent to the fourth green. 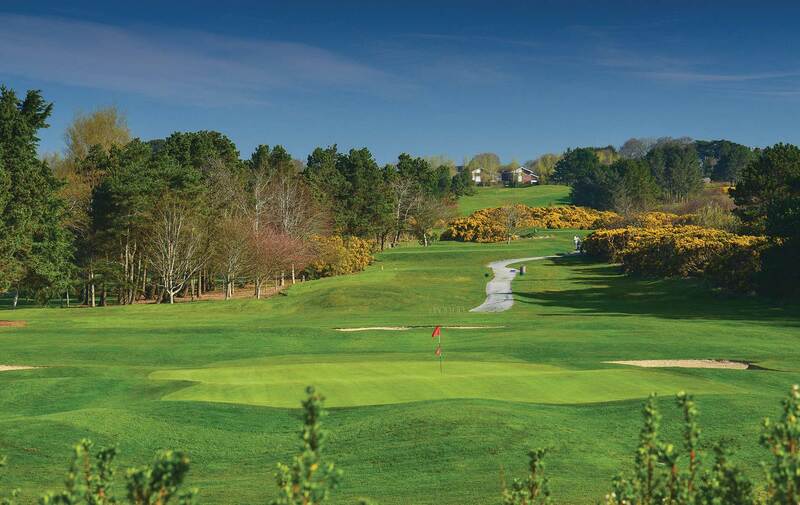 Glenlo Abbey Golf Club: a nine-hole championship golf course designed by Christy O’Connor Jnr. 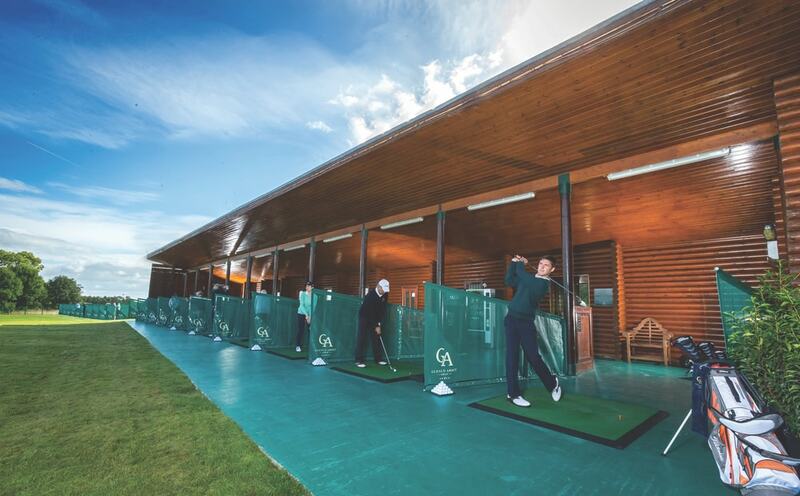 Golf lessons on a one-to-one basis with golf professional Gary Madden are both fun and informative and are complemented by the superior facilities of the twenty-one-bay driving range. The second hole on the C9 at Connemara Championship Golf Links, a 180-yard par 3, with a little water hazard to the left of the green. And on to our final destination. A drive through the wonderfully beautiful wilds of Connemara to Slyne Head and the famed Connemara Golf Links. Driving from Ballyconneely village to the course, one wonders whoever had the foresight to put a golf course almost in the middle of the ocean. As we approach the clubhouse, we can see the lighthouses in the near distance behind the sandy beaches and dunes on our left and the beginning of the course on our right. Once unloaded and welcomed by Dominic in the office, we were delighted to find we had at our disposal a twenty-seven-hole test. We opted for the eighteen-hole championship, and were we delighted. Not a tree in sight, the golfer is lulled into a silly sense of security. A pulled shot here lands one in the rough. A pushed one there, up a grassy dune. Beautiful rolling fairways, greens tucked away and guarded by many grades of bunkers, elevated greens, and elevated tees, with none more spectacular than the par 5 fourteenth built on what must be the highest point in the area. Golf is forgotten as one has a 360-degree vista from Inishbofin, to Slyne Head, to the Aran Islands, back around the mountains of Connemara and Mayo, and onto Inishbofin yet again—breathtaking. The course itself is class. The par 3 thirteenth hole must play as one of the best in Europe with my personal favourite, the fourteenth hole built into a hillside. Holes seventeen and eighteen are par fives running in opposite directions to each other, so having had the breeze in our backs on the seventeenth, we faced a severe test back on the eighteenth. That is the beauty of links golf. And the wind does play a factor here—club pro and superintendent Hugh O’Neill regaled us with tales and fables, one in which one of his professional colleagues played a nine iron stitched one morning on the short par 3 third and returned that evening to a different wind and came up short with a five wood. Hugh insists that the professional should remain nameless, at least in print! And while enjoying Hugh’s company in the clubhouse, one could not help but be distracted by the stunning scenery of the ocean, out onto the islands and rock features, into the hills and mountains, and across the course itself. In a word—stunning. So with our trip near its conclusion, we were left with a memory of four days of hugely enjoyable golf, on four courses that members should be very proud of. While each was a different test, they were united by the professionalism in which they were managed and maintained, a real tribute to the staff. We are left with a serious quandary—when can we do it all again?